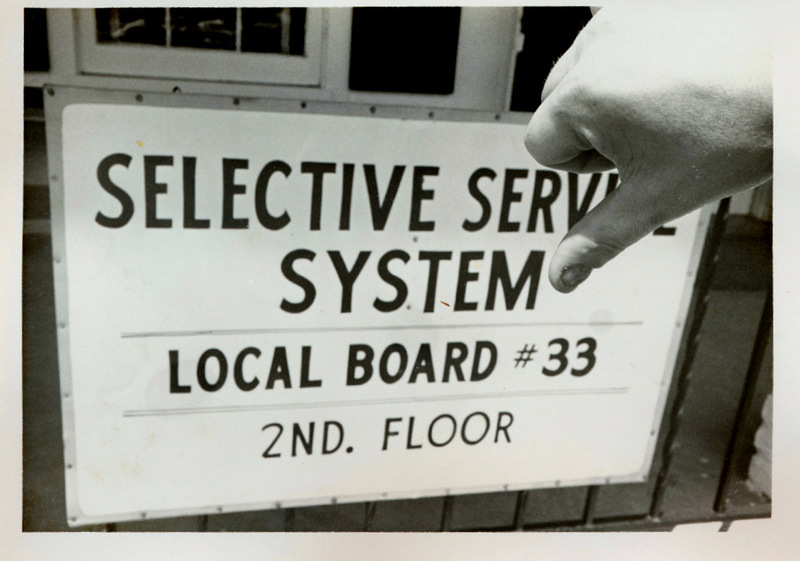 Above: Gren Whitman’s thumb in front of sign outside the Knights of Columbus Hall where the Selective Service rented space. Are the Catonsville Nine a little blurry and Insta-gram-hued for you, decades after those Catholic activists burned draft files in a parking lot behind the Knights of Columbus Hall out on Frederick Road? A new documentary, “Hit & Stay,” premiering locally at the Maryland Film Festival next week, brings that bold act and those dire times into sharp focus. We go down the rabbit hole via shaky black-and-white footage shot that day, May 17, 1968. “Get in the back of the paddy wagon,” a voice is heard saying, as the seven men and two women activists in their dress suits, clerical collars and prim dresses climb in the big white wagon and are driven away by police. 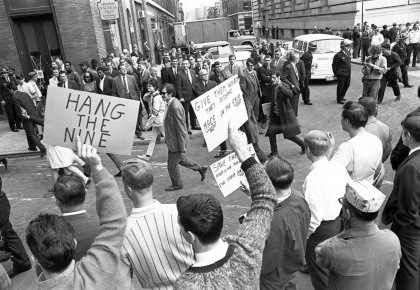 The film then follows them on their perilous path: to an eventual courtroom confrontation in Baltimore that put the Vietnam War on trial, attracted 2,500 demonstrators to War Memorial Plaza, garnered worldwide media attention and placed them at the center of the movement that ultimately stopped the draft and the war. Why Catonsville? Why didn’t the press latch on to earlier actions, Baltimore-based filmmakers Joe Tropea and Skizz Cyzyk ask early in the film, noting that Father Philip Berrigan and three other people (“The Baltimore Four”) had poured blood on draft files at the Baltimore Custom House in 1967, a year earlier. But the Catonsville action had the narrative hook of the dashing priest-brothers Philip and Daniel Berrigan, defying the pro-war Catholic Church hierarchy, an angle the activists knew would prove irresistible media bait. “If you’re gonna get involved with a movement and there’s priests involved – back then? ’68? They’re gonna cover the priests,” says Brendan Walsh, co-founder of West Baltimore’s Viva House and a member of the team that supported The Nine. 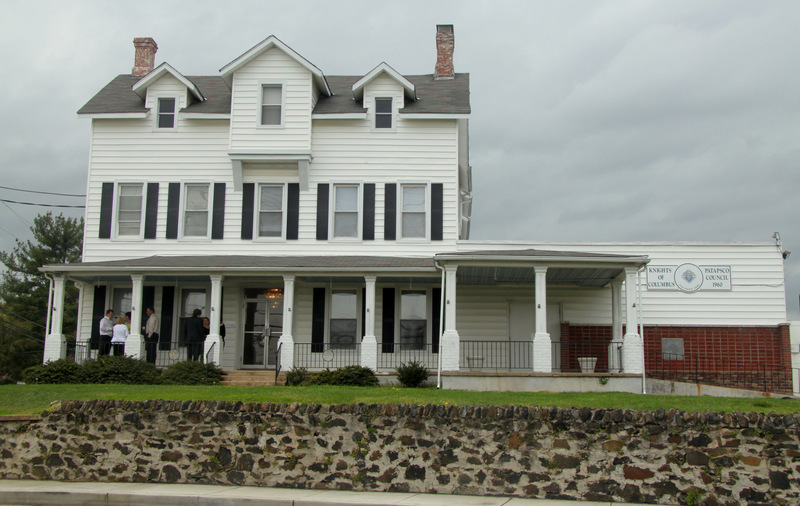 Along with the Berrigans, The Nine included Thomas Melville and Marjorie Melville, a former Catholic priest and nun; David Darst, a Christian Brother; John Hogan, a Maryknoll Brother; Thomas Lewis; George Mische and Mary Moylan, a registered nurse. The filmmakers tell the story using old footage, recent interviews with surviving members of the group and their supporters, explicit images of war horrors, like the ravaged flesh of Vietnamese children burned by napalm, and the reflections of eminences of the Left such as Howard Zinn, Noam Chomsky, Bill Ayers and Amy Goodman. 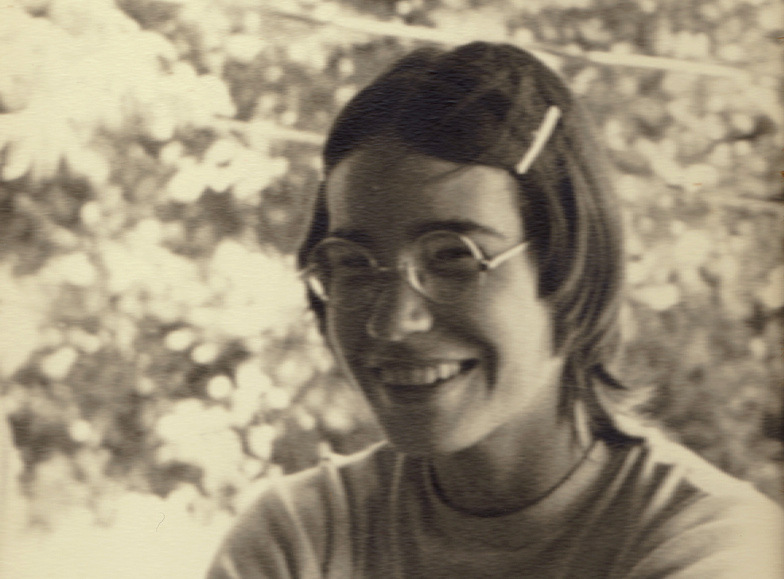 But perhaps the most memorable moments in “Hit & Stay” are delivered by little-known characters like Suzanne Williams, a Massachusetts teenager at the time who could have been you back then or your earnest 17-year-old now, ordinary people whose smoldering anger about the U.S.-led war flamed into action, inspired by what happened in Catonsville. “In my junior year of high school, I was arrested with some other folks at the Boston Army Base where we were passing out leaflets urging people to not take part in the Vietnam War and resist the draft and stuff,” recalls the now-adult Williams. “I was sentenced to 20 days in jail,” said Williams who, upon getting out of jail, undertook an action that earned her a stint in federal prison – pouring black paint on draft files in a Boston federal building. 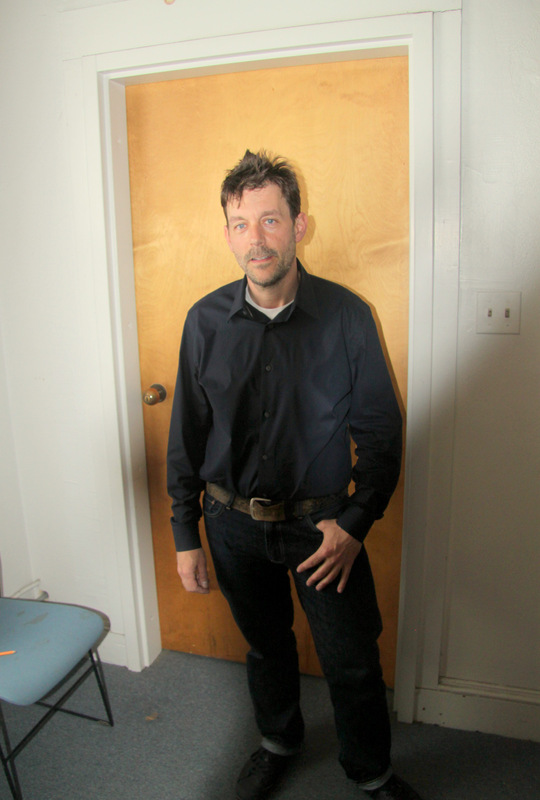 That the draft was stopped by the bold actions of regular folk, not heroic saints, is just one of the insights that emerged for Tropea from the six-year process of making the documentary, a project he undertook after writing on the subject for his masters thesis at University of Maryland Baltimore County. After Catonsville, there were 50-some actions across the country, and 3-4 million draft files destroyed, according to Mische. Among them, along with the Boston Two were: the Milwaukee 14, the Chicago 15, the Pasadena Three, the Silver Spring Three, Women against Daddy Warbucks, the Rochester Flower City Conspiracy, the Beaver 55, the East Coast Conspiracy to Save Lives in Philadelphia, the DC Nine, the New York Eight, the Boston Eight, the Minnesota Eight, and the Camden 28. Not all of them were carried out by Catholics. “We were two 18-year-old Jewish kids from New York,” says Jerry Elmer, recalling his success at burglarizing a Providence federal building where draft records were kept. And not all of them were carried out by men, the film makes clear, pursuing a sub-theme of female activists’ struggle for respect in those early days of the women’s movement. “Nab 6 Girls at Anti-War Rally,” one headline flashing by reads. Then there’s a photo of his brother, Paul Good, in uniform standing in a knotty-pine-paneled room, smiling. Baltimoreans will recognize many of the people and places in the film. The massive march downtown for the trial, for example, started at the Wyman Park Dell and flowed down Howard Street – “at that time the city’s big shopping street,” Walsh explains in the movie. The big, white, colonial-style Knights of Columbus building is still there. On the recent morning when Tropea took a reporter to visit, it was being used for a funeral party. He pointed to the second-floor window that had been broken, weirdly, on the day of the action, by a clerk throwing a phone through it, apparently in hopes of attracting attention and help. “I had had no idea about the amount of strategy and coordination and about how all these things were connected,” he said, referring to all the other actions around the country to stop the war, and to the Catholic Workers and the Ploughshares movements, still working today on peace, poverty and nuclear disarmament issues. “I had no idea the extent the government would go to stop somebody like Phil Berrigan,” he said, citing the later prosecution of Berrigan and others, known as the Harrisburg 7, for allegedly plotting to kidnap Henry Kissinger. Had the government’s case – which was “really insubstantial” – prevailed, Tropea said, they could have faced serious prison time. Finally, he said, he was struck by the way the U.S. government had continued to pursue deadly military adventurism abroad but with less resistance from a disengaged mainstream culture.